This workshop is offered to watercolourists who wish to present their artwork without glassed frame. As well as to artists who have been using other mediums and just wish to use watercolour but feared size limits and/ or the dreaded glassed framing. Diane demonstrates the manner of preparing watercolour paper in order to stretch it over a canvas and/or a prepared wooden frame. She will also demonstrate how you can re-point your corners if need be. A watercolour demonstration on paper will follow. The participants are welcome to prepare and paint their own artwork during the day-workshop, and are encouraged to bring their own subject material. Diane will show how to treat the artwork once it is painted and completely dried. If the artwork of the participants is not fully dried, they will be able to easily continue the process at home using the method and products Diane recommends. She will be available throughout the day, to offer advice and tricks to achieve a watercolour without glass. Diane is thankful to Stephen Rothwell from Canada and to all artists who have been using and exploring this glass-free framing method for their watercolours. I should mention that quite a few artists from Europe and Asia have been using the non-traditional framing and have taken advantage of it particularly as a selling point. Registration will be limited to 16 and on a first come first served basis. This demonstration will introduce Holbein Artist Watercolour and Mediums as well as Holbein's innovative Designer and Acryla Gouache. 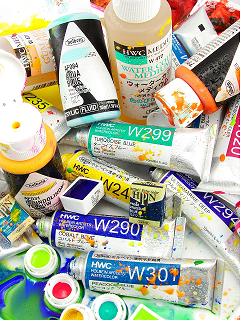 Holbein’s world renowned watercolours are available in an extensive palette of 108 highly concentrated colours. We will discuss what makes them the preferred choice to watercolourists worldwide and what distinguishes Holbein’s Watercolour from other watercolour lines. Holbein’s 6 Watercolour Mediums can be used with watercolours to create interesting effects and enhance the properties of watercolours. We will also discuss gouache and the difference between Holbein’s traditional Designer and Acryla Gouache. All participants will receive Holbein, Strathmore Artist Paper and General Pencil samples as well as literature to take home. One lucky attendee will also take home a door prize with a retail value of approximately $100! HK Holbein's Artist & Educator, Jamie-Lou Nicol was born in Kingston, Ontario and grew up in the small town of Verona located north of Kingston. Nicol graduated from Sheridan College in 2004 with a major in Advanced Glass Blowing. Over the years, she has exhibited her artwork in Ontario at numerous galleries and arts and craft shows. Jamie-Lou has a passion for abstract art and calligraphy. She has experience using various art mediums in her work such as acrylics, acrylic mediums, watercolour, pencil crayon, ink and glass. Since 2015, Nicol has been working for Holbein Artist Materials Canada where she works in sales and marketing as well as teaching Holbein demonstrations and workshops. This is free for all OWS members but registration is limited to 25. Brent Goss will be presenting "Photographing your Artwork"
Nepean Visual Arts Centre, 1701 Woodroffe Ave. This is an important part of documenting and marketing. ​Please bring your cameras, questions and experiences. No RSVP required. Everybody is welcome. Rachel MacDonald has enabled us to setup an opportunity to paint a beautiful Ghanaian woman in full African dress. This is free to all OWS members (donations welcome for the model) although space is somewhat limited and RSVP’s are requested. No instruction, but a chance to experiment with your own ideas, while working alongside other OWS artists. Several tables are available or you can bring your own easel. No critical judgments allowed, simply an occasion to play together! Barrhaven, 100 Malvern Dr, Nepean, ON K2J 2G5 - 2nd floor. The next exhibition for all members of the OWS will be held at Walter Baker Sports Centre. Please complete the registration information below and email your information to President@owswatercolour.com by Thursday, Dec 6. Please see the registration form below for more details. Registration/submission of paintings is in person only on Saturday, December 1, at Loblaws, 2nd floor, College Square – 1980 Baseline, Nepean. will be the guest speakers. ​Registration/Submission of paintings: in person only (no electronic submissions) Location: Loblaws, 2nd floor, College Square – 1980 Baseline, Nepean Date: Sunday July 15, 2018 Registration for jurying: drop-off is 10:30 am and pickup is 12:00 noon.